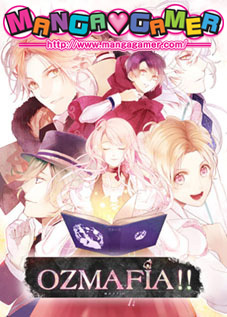 Code: Realize ~Guardian of Rebirth~ is one of my favorite recent otome games, and while the cast is full of great characters, I have a soft spot for the goofy inventor Impey Barbicane. My affection for him is largely due to his voice actor, Showtaro Morikubo, recently becoming a favorite of mine when I fell in love with his portrayal of Makishima in Yowamushi Pedal, but I will admit that personality-wise, I’m slightly more partial to suave yet sassy characters like Lupin (sorry Impey!). Regardless, I was beyond thrilled when I found out that flowermiko had purchased me a copy of Impey’s new character CD to review for the site! 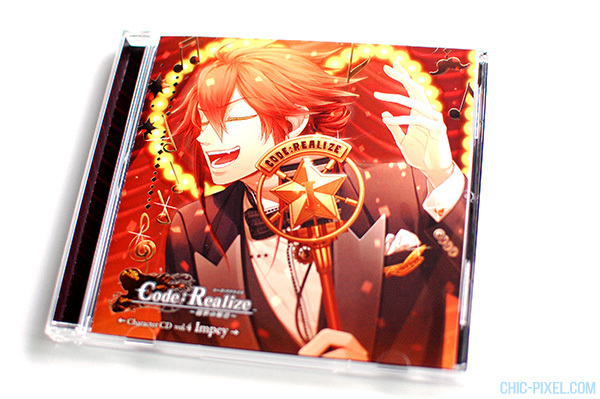 Officially titled Code: Realize ~Guardian of Rebirth~ Character CD Vol. 4 Impey (what a mouthful! 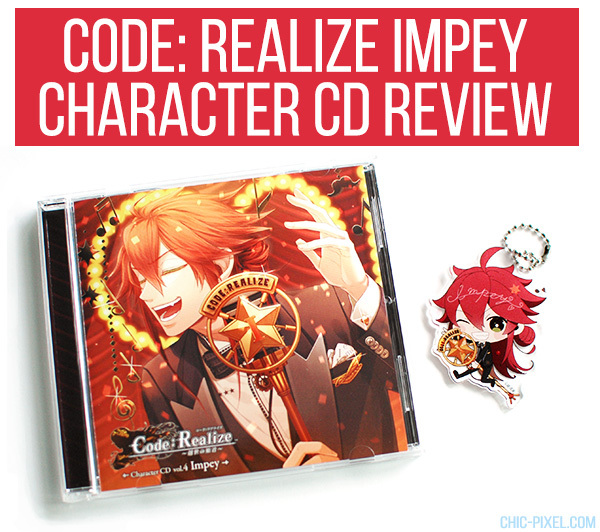 ), the CD is comprised of Impey’s character song, “Trip to the Moon,” an “off vocal” version for you to practice your karaoke skills, and a short audio drama featuring the man himself. One of the highlights of the Code: Realize character CD series is the new art of each character in a tuxedo, singing into retro microphones featuring their first initial. Impey’s is definitely the most dynamic, and interestingly he’s the only one with his eyes closed. 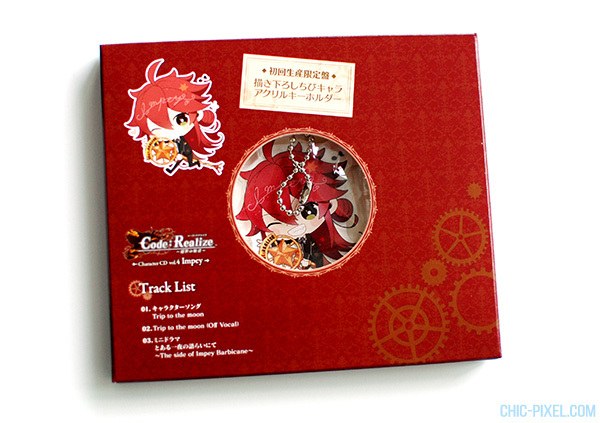 The first press edition comes with an adorable acrylic keychain of chibi Impey in a similar pose to the cover art of the CD. I absolutely love the chibi art in Code: Realize, and his CD outfit is super cute, so I totally adore the keychain! 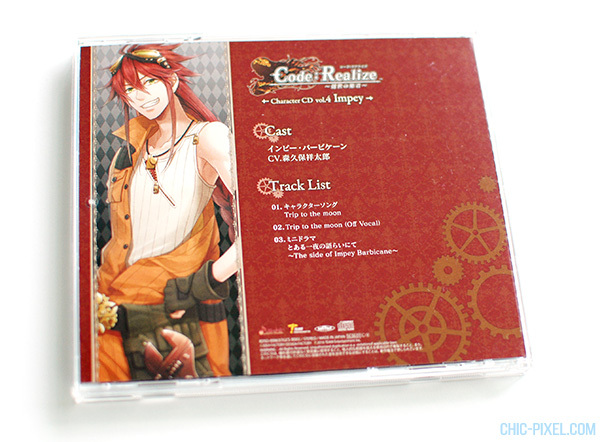 The back of the CD is pretty standard, and features character art of Impey from the game in addition to the cast and track list. 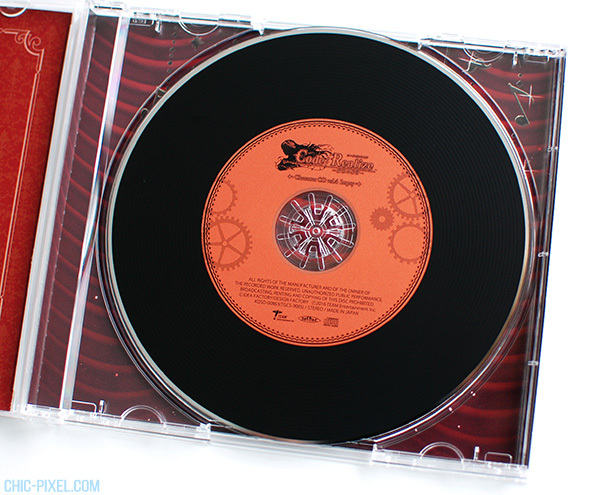 I love how the CD itself is designed to look like a record! They’ve done a great job maintaining the steampunk theme of the game in the CD package design. Surprise! 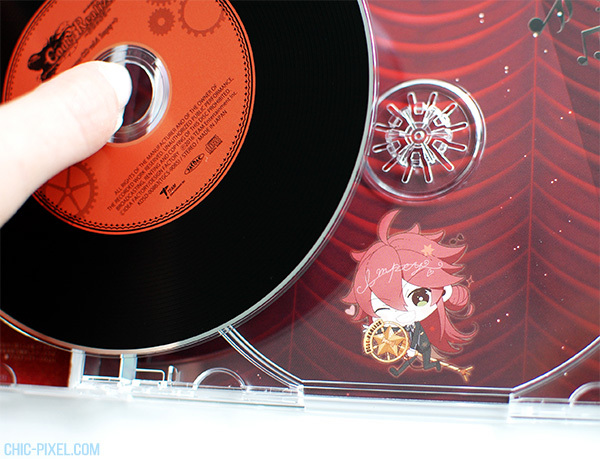 There’s even a little chibi Impey under the CD itself. 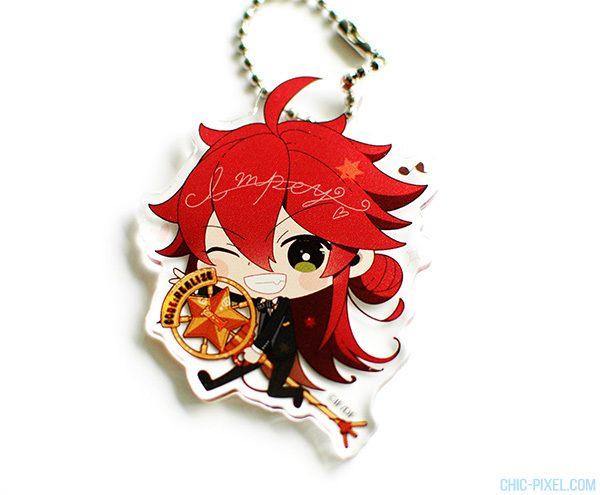 I’m glad they used the art on something besides just the first edition keychain so you can still enjoy this adorable rendition of Impey even if you don’t manage to snag the first edition. 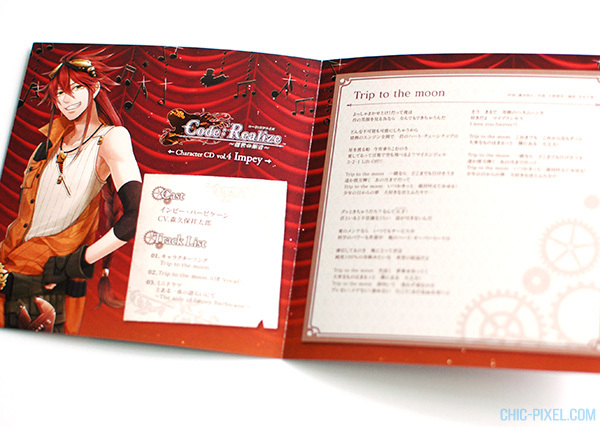 The booklet that comes with the CD is nothing fancy, but it includes the cast and track list information, along with lyrics to “Trip to the Moon.” It’s too bad they didn’t use different art from the back of the CD, though! Trip to the moon Itsuka kitto Zettai kanaete miseru! Trip to the moon Someday I’ll make it come true! Gutto kichau daro? Nante jiiniasu! Daiji na mono wa marutto Koko ni aru Daijoubu! The important things Are right here It’ll be fine! What a doofus! Impey’s song definitely fits his character, but after spending a lot of time listening to Van’s “Endless Pain” (I translated it for flowermiko too, if you’re interested! ), I have to say I prefer the melody of Van’s! I do enjoy listening to Showtaro Morikubo sing, and the message of the song is really cute, though! After the karaoke version of “Trip to the Moon” is Impey’s audo drama, which comes in on the shorter side at 13:05. The premise is that this scene takes place during an evening sometime over the course of the game, as Impey and you/Cardia are getting to know each other better (like many drama CDs, it is acted out as if the character is talking to you). Impey invites you/Cardia to look at the stars, and goes on a very long tangent about the blue moon. If you ever wanted to learn about blue moons, he’s got you covered! It’s hard not to be biased as such a big Showtaro Morikubo fan, but I really enjoyed this CD. I have to say I prefer the voice actor to the actual character, though, so bigger Impey fans will likely enjoy this even more. You can get just the CD for ¥1,500, which is very reasonable for a single and drama track, but if you’re willing to shell out ¥800 more for the keychain, I highly recommend it! Thanks again to flowermiko for sponsoring this post and enabling my growing Showtaro Morikubo obsession! 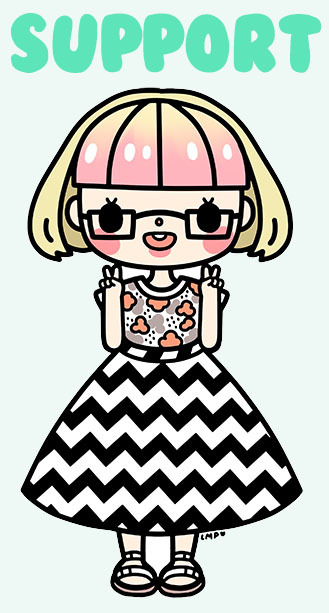 If you’d like to support Chic Pixel by sponsoring a review, you can purchase an item from my Amazon Japan wishlist for me to cover!